Burlington Northern Railroad system map at the time of the BNSF merger. BN lines are colored in green. With three of four predecessor railroad locomotives in tow, GE U33C #5738 departs Livingston, MT in August 1971. The Burlington Northern Railroad (reporting mark BN) was a United States-based railroad company formed from a merger of four major U.S. railroads. Burlington Northern operated between 1970 and 1996. Burlington Northern purchased the Atchison, Topeka and Santa Fe Railway on December 31, 1996 to form the Burlington Northern and Santa Fe Railway (later renamed BNSF Railway), which was owned by the Burlington Northern Santa Fe Corporation. That corporation was purchased by Berkshire Hathaway in 2009 which is controlled by investor Warren Buffett. The Burlington Northern Railroad was the product of a March 2, 1970, merger of four major railroads—the Great Northern Railway, Northern Pacific Railway, Spokane, Portland and Seattle Railway and the Chicago, Burlington and Quincy Railroad—as well as a few small jointly owned subsidiaries owned by the four. The merged railroad was initially going to be called Great Northern Pacific & Burlington Lines. Although the four railroads shared common ownership (including the headquarters building in Saint Paul, Minnesota) from the days of the James J. Hill era, the four railroads previously had unsuccessfully attempted four mergers to unify the Hill Lines: 1896, 1901, 1927 and 1955. Surprisingly the merger was finally approved in 1970 even though a challenge occurred in the Supreme Court, which reversed the result of the 1904 Northern Securities ruling. To further expand the Burlington Northern railroad, a single track was constructed in 1972 into the Powder River Basin to serve various coal mines. On November 21, 1980, the St. Louis - San Francisco Railway was acquired, giving the railroad trackage as far south into Florida. By 1981, however, the holding company of the railroad, Burlington Northern, Inc. relocated headquarters from Saint Paul, Minnesota to Seattle, Washington and spun off all non-rail operations to Burlington Resources in 1988. In 1971, BN/C&S/FW&D carried 64116 million revenue ton-miles of freight; in 1979 the total was 135004 million. Most of the increase was Powder River coal from Wyoming, a fount of traffic unprecedented in United States railroad history, and one which BN had to itself until 1984. The Burlington Northern, along with handling freight trains, briefly operated inter-city passenger trains. The BN had begun operation just a matter of weeks before the end of service of the California Zephyr, which had been operated by the CB&Q, in conjunction with the Denver & Rio Grande Western and Western Pacific railroads, and continued to operate the North Coast Limited, Empire Builder and Denver Zephyr until Amtrak took over intercity passenger service in May 1971, thus becoming the last "new" Class I railroad to operate its own passenger trains. The BN also operated a commuter line inherited from the CB&Q from Chicago Union Station to the western suburb of Aurora, Illinois. On September 22, 1995, the Atchison, Topeka and Santa Fe Railway merged with the Burlington Northern to create the Burlington Northern Santa Fe Railway. However, the merger was not official until December 31, 1996, when a common dispatching system was established, Santa Fe's non-union dispatchers were unionized and the implementation of Santa Fe's train identification codes systemwide. On January 24, 2005, the railroad shortened its name to BNSF Railway. The Burlington Northern traversed the most northerly routes of any railroad in the western United States. These routes started at Chicago, Illinois and ran west-northwest to La Crosse, Wisconsin. From here the routes continued northwest through Minneapolis and St. Paul, Minnesota to Grand Forks, North Dakota. From Grand Forks the routes ran west through North Dakota, Montana, and Idaho to Spokane, Washington. The former GN routed through North Dakota/Northern Montana, crossing the continental divide at Marias Pass, while the former NP line routed through the southern part of Montana (which was spun off to Montana Rail Link in 1987), crossing the continental divide at Mullan and Homestake Passes. At Spokane the routes split into three. The former Great Northern route ran west to Wenatchee, Washington, crossed under the Cascade Range at New Cascade Tunnel on Stevens Pass, and descended to the Puget Sound region through Everett, Washington. The former Northern Pacific turned southwest towards the Tri-Cities, then northwest to Yakima, Washington, and crossed under the Cascade Range at Stampede Tunnel, descending to the Green River Valley at Auburn, Washington where it connected with existing NP lines from British Columbia to Portland, Oregon. The Spokane, Portland and Seattle ran southwest to the Tri-Cities then followed the north bank of the Columbia River to Vancouver, Washington. With the acquisition of the St. Louis – San Francisco Railway the route was extended into the South Central and Southeastern United States. Transport Statistics shows BN operated 23609 miles of line and 34691 miles of track at the end of 1970; it shows 4547 SLSF miles of line not including QA&P and AT&N. At the end of 1981 BN showed 27374 miles of line and 40041 miles of track. The livery of the Burlington Northern traces its history to Chicago, Burlington and Quincy Railroad. 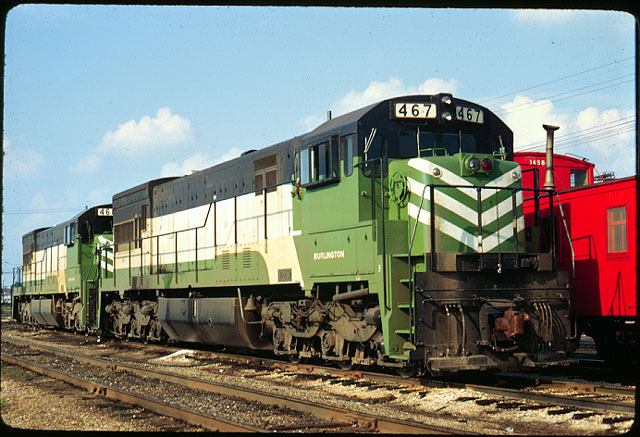 EMD GP40 #629 was painted in a green, black and white scheme that introduced the BN's lettering and logo. The green color was later known as Cascade Green due to the reflections of pine trees and nature along various routes the trains of the CB&Q traveled. As the final approval of the merger was approaching the Spokane, Portland and Seattle Railway purchased 6 EMD GP38s in February 1970 that were delivered in the Burlington Northern paint scheme. By the 1980s the locomotives and rolling stock had an unfortunate habit of camouflaging into the scenery and causing accidents at railroad crossings. In late 1984 the BN commenced the High Visibility study which applied orange and black nose stripes and orange along the cab face on one locomotive followed by two new orders of locomotives: EMD SD40-2, EMD GP50, and EMD SD60 respectively. By 1987 the study did not show vast improvement of the locomotive's visibility and was dropped. In 1989 the BN reactivated its High Visibility study, trying more white paint on the nose and cab face. The first unit, GATX Rebuild EMD GP40 #3079 emerged in April 1989 with a white cab face, end-sill stripes, and a large BN logo applied on the nose; dubbed White Face this scheme proved to be a success with only a minor change occurring in 1991 with the application of a two-inch wide separator stripe. In October 1990 BN departed from its Cascade Green, black and white scheme on its business car and locomotive fleet. Adopting Grinstein Green (an altered version of Brunswick Green/British Racing Green and named after the president of Burlington Northern, Gerald Grinstein), Cream, and Alizarin Red. This scheme was applied to EMD F9A-2 #BN-1, EMD F9B-2 #BN-2, and EMD E9A-2 #BN-3, of the locomotive fleet and the business car fleet. In November 1993, brand new EMD SD70MAC #9401 received the Executive colors, making a departure from the standard Cascade Green, White & Black scheme. This trend continued only on the EMD SD70MAC's until BNSF #9837. EMD GP40 629 First locomotive experimented in pre-Burlington Northern Livery in 1968. EMD SD45 & GE U23C 516 – 530, 460 – 468 Pre-Burlington Northern livery designed by the CB&Q in 1969. EMD GP38 200 – 205 (2072–2077) First new locomotives for the Burlington Northern; ordered by the Spokane, Portland & Seattle in February 1970. EMD SD40-2 8174 Carried a ‘‘Together at Last’’ BN-SLSF Merger slogan along the walkway. EMD SD40-2, EMD GP50, EMD SD60 8002, 3110 – 3162, 8300 – 8302 Painted in the experimental High Visibility Tiger Stripes paint scheme. EMD/GATX GP40G 3079 The first locomotive to receive the Whiteface paint scheme in April 1989. EMD GP50 3110 & 3112 An alternative version of white with orange "Tiger Stripes" instead of black. EMD F9A-2, EMD F9B-2, EMD E9A-2 BN-1, BN-2 & BN-3 The first new locomotives painted in the Executive scheme. EMD GP38-2 2100 The only unit receiving white striping along the front cab section. EMD GP9 1813 & 1863 Received "The National Academy of Railroad Sciences" lettering along the carbodies. EMD SD60M 1991 Painted to honor the employees serving in Desert Storm. EMD SD40-2 7149 & 7890 Modified by Energy Conversions Inc. to run on compressed liquefied natural gas (refrigerated liquid methane). EMD SD9 6121 Operation Lifesaver logos applied. MK GP28M 1510, 1521-1524 Operation Lifesaver logos applied. EMD SD70MAC 9647 Introduced a proposed Burlington Northern Santa Fe paint scheme. EMD SD70MAC 9709–9712 9709 – 9710 were the last two new locomotives for the BN delivered in January 1996. 9711 – 9712 are the first new locomotives for BNSF. EMD GP50, EMD SD40-2 3120 & 7812 The last locomotives painted in Burlington Northern green on August 8, 1996. MK GP39E 2911 & 2931 Painted in an experimental Cascade Green BNSF scheme. Burlington Northern 1 and 2, formerly Northern Pacific Railway 6700A and 7002C, EMD F9s, were built in 1954 and later rebuilt by BN for special train service. They are currently owned by the Illinois Railway Museum and are on display in Union, Illinois. A Burlington Northern tie treating plant was responsible for the Burlington Northern (Brainerd/Baxter) United States Environmental Protection Agency Superfund site, located between the cities of Brainerd and Baxter in Crow Wing County, Minnesota. The tie treating plant operated on the property between 1907 and 1985 and treated railroad ties with creosote and fuel oil. Wastewater generated from the wood-treating process was sent to two shallow, unlined ponds. This created a sludge which contaminated both the underlying soils and the groundwater with creosote and polynuclear aromatic hydrocarbons (PAHs). ↑ For a pictorial survey of the BN's diesels from Day 1, see Olmsted, Robert P., "The Green Machines" (1986). ↑ Not including 692 route-miles operated by C&S, 1201 FW&D, 186 Oregon Electric, 152 Oregon Trunk, 19 Walla Walla Valley and 2 MA&CR. ↑ Not including 678 route-miles C&S and 1181 miles FW&D. Burlington System from the Handbook of Texas Online. Retrieved 2005-05-26. Wikimedia Commons has media related to Burlington Northern Railroad. This page was last modified on 12 January 2016, at 17:20.